Join us on the Colville NF this July and August as we celebrate the 50th anniversary of the National Preservation Act of 1966! Our celebration will involve "reconstructing the past" to save and preserve an iconic fire lookout. 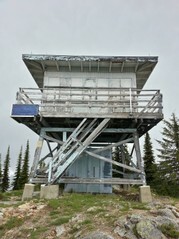 The Salmo Lookout was built in 1964, and sits at an elevation of 6800' (a.s.l.). It commands an impressive view of the Salmo-Priest Wilderness and the snow-covered peaks of the Selkirk Mountains. It was last staffed full-time as a fire-lookout in the mid-1970s and, although largely disused since, sill functions as originally intended intermittently when thunderstorms roll through the region in the summer. Its summit is a popular viewpoint for visitors to the area, who can see, without obstruction, vast, rugged wilderness, two states, and one Canadian province. The adjacent wilderness is the home of wildlife such as grizzly bear and moose, and of the last woodland caribou herd in the 'Lower 48.' There is a strong desire on the part of the locals and the Forest Service to preserve this 52-year-old structure. Therefore, this year with your help, we will put this building and its commanding views back "on the map." It will be sweaty, dirty work, and will certainly be detail oriented, but also a lot of fun! What's more, you will be able to say that you helped breathe life back into one of the Colville National Forest's most scenic and long-live lookouts - we hope to see you this summer!